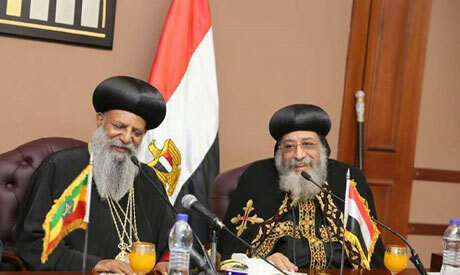 The Coptic Orthodox Church in Ethiopia has expressed hope that prosperity will prevail across Africa during Egypt's chairmanship of the AU this year. Egypt’s President Abdel-Fattah El-Sisi travelled to Addis Ababa on Saturday to attend the AU summit, and he will assume the 2019 chairmanship of the AU on Sunday. "The Coptic Orthodox Church and all members of the Coptic community in Ethiopia congratulate Egypt for assuming the presidency of the African Union (AU) and restoring its leading role in Africa," the church said. The Ethiopian Orthodox Tewahedo Church is the dominant religious group in Ethiopia, with nearly 50 million members. It was under the administration of the Coptic Orthodox Church in Egypt until 1959, when it was appointed its own patriarch by the Coptic Orthodox Pope Cyril VI. In 2015, Abuna Mathias, patriarch of the Ethiopian Orthodox Church visited Egypt, where he met with the President El-Sisi, the Grand Imam of Al-Azhar Ahmed El-Tayyeb and Coptic Orthodox Pope Tawadros II. Relations between Egypt and Ethiopia have been witnessing tensions in recent years over the construction of the Grand Ethiopian Renaissance Dam (GERD). The two countries have been at odds over the construction of the $4 billion hydroelectric dam, which Cairo fears will threaten its Nile water supply.